1) Support designated country search. National list shows the flag, and at the same time display English and mother language for convenient choice. 2) Support single or multiple keywords search with manual input. 3) Support specifying URL for directed search. 4) Support importing multiple keywords from the TXT file to search. 5) Support common search engines such as Google, Bing, Yahoo, Yandex, AOL, and ASK, etc. 6) Automatically remove duplicate email address. 7) Support exporting mail list to txt, csv, xls and other formats, you can freely choose to export the column, such as email, or the corresponding URL is also exported. The advantage is that it is convenient to import the Verifier and Sender programs for the next step. 9) The internal integrated multi-thread acquisition technology, collection speed is at the leading level. As a CEO of railway equipment co.ltd, the biggest challenge for me is how to find the demand side of railway equipment every day. My staff recommended Antsoft Email Extractor to me. We conducted a trial and found that searching for customers is very fast, keyword matching is also very strong, so we quickly purchased this software. And now we find a lot of customers with intention. 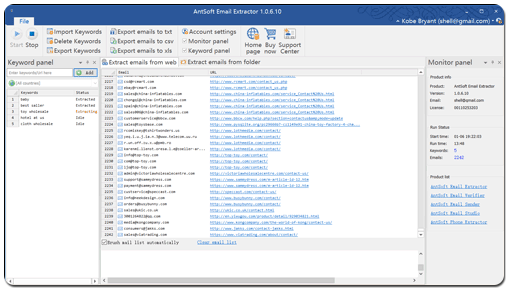 We sincerely thank Antsoft Email Extractor and the provider.